In Business Continuity Awareness Week 2016, maybe we should be asking: just how important are an organisation’s people to achieving a return on investment in Business Continuity? I read a tweet last week about the possible remake of “Citizen Smith” the 1970’s TV comedy with the unmistakeable rallying call of South London urban guerrilla “Wolfie” Smith: “Power to the People!” I guess you had to be there, but strange what brings on a blog. OK, the Tooting Popular Front may not be your obvious BC poster material, but “Wolfie” may have had a point about the importance of people power. Sub-optimal response: We may have determined how we will measure ROI or VOI, but it is likely that these calculations will be dependent on the significant assumption that everything will work according to plan. After all, isn’t that the point of the investment? But what if it doesn’t? The underlying assumption is that staff are engaged and supportive but if you don’t get what you need when you need it from people in your organisation, how will your post investment review fare? Missed opportunities: In terms of the value of business continuity, we may also want to think about the wider organisational context, and consider the behaviours and attributes that drive performance in successful organisations. Is there additional value to be derived through a people focused approach to BC and is this value being given sufficient weight? Here is a brief look at 3 key people considerations that, when addressed in collaboration with other organisational disciplines, can help BC practitioners deliver continuity programmes that stand up to ROI scrutiny, supporting the long term performance and reputation of their organisations. To what extent are people truly engaged in the preparation, planning and ownership of continuity and crisis arrangements? Told or truly engaged? Ask yourself: has your plan been designed to meet the needs of your organisation or the needs of your people? If your answer is both, then you have started on a journey to effective engagement. Think about the methods used and their effectiveness in engaging people in your BC programmes: does BC have importance as a leadership priority and is it being effectively communicated? From involvement in BIA’s through to individual roles and responsibilities to training, awareness and ownership, get the organisation on board to deliver the skills and behaviours you need for a meaningful plan and will depend on for a successful response. Does the organisation have the capability to prevent the escalation of emerging threats in the first place? Benjamin Franklin may have been talking about fire-fighting when stated that “An ounce of prevention is worth a pound of cure,” but it seems apt for dealing with managing business risks today. An organisation that builds risk awareness and encourages challenge to the conventional wisdom also promotes the dynamic management of risks – as well as recognising opportunities by the way. Take the risk conversation out of the Boardroom and out of the Risk departments, to those who can protect your organisation through their involvement, insight, vigilance, curiosity and appropriate action in the course of their daily duties from preparation through to recovery. How can an organisation ensure the mobilisation and continued support of critical staff in the continuity phase? How do you maintain the support of the wider organisation, who are indirectly impacted, during an event? People form a critical aspect of the BC planning process: they are part of the problem and also part of the solution. But the actions and behaviour of individuals, faced with real or potential disruption, cannot be either assumed or carefully mapped. Fail to recognise and prepare for this well in advance at your peril. Instead give yourself the best chance you have of getting what the organisation needs and expects from its people when it needs it the most. Recognise the importance of understanding what they need and expect and make communications a priority before, during and after an event: from information and dialogue, to welfare and support, to HR policies and practical solutions, supporting behavioural change, as the continuity cycle evolves. 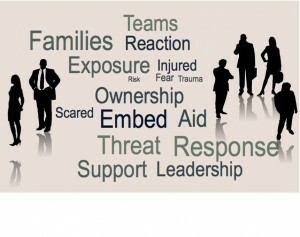 From those adversely affected, their families and friends, your critical staff, and also your response teams, the wider organisation and your support network, there is too much at stake regarding the effectiveness of your response and ultimately your reputation to leave this to untested assumptions. There is no doubt that the people priority is well established in BCM plans and programmes. Taking it further, attention to people aspects can deliver benefits across the whole BC cycle and moreover, drive additional value into the wider organisation. But getting it wrong can hit the organisation with even greater losses than anticipated through the fallout from a sub-optimal response and not just directly from a longer time to recover: think carefully about the significant impact of staff disengagement and loss of trust on productivity and retention, and the reputation of the organisation, as a customer, supplier and also an employer. To improve ROI start planning today to develop an employee engagement programme. Think about who you need to help you with this and take the first step to reassess your current arrangements from a people perspective – Power to the People! Previous article Is the answer ROI, Value or Continuity?